Hand-washing is such an event around our house, and I've been looking for a way to make the process more fun for Miss O -- but the fun hand soaps geared toward kids are usually filled with toxic ingredients I'm not willing to let her lather up with. So when I learned Method is debuting these adorable Mickey & Minnie Mouse hand soaps April 1st at Target, I knew they would help her get "squeaky" clean while making her excited to have her very own special soap. 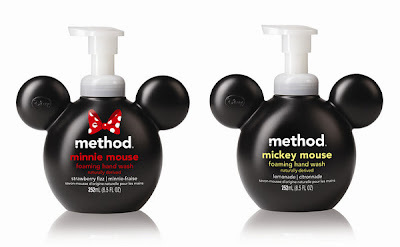 The delicious scents are Lemonade Mickey and Strawberry Fizz Minnie, and it's amazing how the simple act of shaping a soap dispenser like the iconic mouse ears will really rev a kid up to dash to the sink after going potty. Additionally, the soap is biodegradable and non-toxic,and it doesn't contain parabens, phthalates, triclosan, EDTA or animal-by products. And the cute packaging is recyclable and made with 25% recycled plastic -- and never tested on mice (ha ha) or other animals. "Yes, we do in fact use this particular ingredient, which is derived from coconut oil and used for its lathering and efficacy properties, in a number of our products at minute levels. There has been some controversy over SLS being carcinogenic. SLS is a safe ingredient and has not been classified as a known, probable or even suspected carcinogen by either the International Agency for Research on Cancer (www.iarc.fr) or the American Cancer Society (www.cancer.org). The ACS has actually gone so far as to issue a statement to this effect. While the carcinogen concern is completely unfounded, SLS can in fact be a moderate skin and eye irritant when used in high concentrations and unbuffered. Method only uses SLS in our formulations at sufficiently low concentrations so that any irritation concern is irrelevant. When deciding to use Sodium Lauryl Sulfate in some of our formulations, Method did a complete assessment of the environmental and health aspects of this ingredient, including tests for toxicity and biodegradability. This was done in cooperation with the EPEA, an independent environmental research institute led by Dr. Michael Braungart, author of the landmark text Cradle to Cradle. 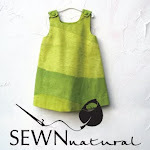 Their findings showed SLS to be altogether safe in its intended usage, non-toxic, non-carcinogenic and environmentally preferable." Readers, what soap do you use for your kids for hand-washing? I've always contended that a pump soap is more sanitary than a bar soap at the bathroom sink, but I'd be curious to learn what you all use on your little ones! Please let me know in the comments! These pumps are soooo cute!! I too prefer pump soap over bar soap...there's just something about sharing a bar of soap with someone else that has always grossed me out. I have a pump that is just for our three year old that we still stick Johnson and Johnson baby soap in it for her just in case she gets a little zealous while washing and gets it in her eyes.